Like the pearls that were once gathered from its warm waters, Abu Dhabi is carefully-crafted, glossy, and exclusive – a mature antithesis to its boisterous neighbour Dubai. Believe it or not, this cosmopolitan city is less than 50 years old; before oil drilling began in earnest in the 1960s, the prime industries were pearl diving and trading with neighbouring Gulf countries. Now, the UAE capital is a hub of five-star international hotels, flashy cultural attractions and slick restaurants. In true Middle Eastern style, it has family values at its heart: you could fill a week just touring the theme parks, shows and entertainment venues with the kids. Or, if it’s a grown-up city break you crave, cram your schedule with skyscraping cocktail bars, fantastic shopping, and adrenaline water sports in that bounteous turquoise sea. This two-day itinerary is an action-packed starter – but don’t blame us if you hanker for a longer stay. Beat the crowds by starting early at Sheikh Zayed Grand Mosque (9am-10pm Sat-Thurs, 4.30pm-10pm Fridays, free) – the only mosque in Abu Dhabi that’s open to non-Muslims. This huge white Italian marble complex will make your jaw drop: it’s fairytale Arabia on a Hollywood budget. Think twinkling gold-trimmed minarets, cavernous archways, and vast 24-carat gold chandeliers with Swarovski crystals as big as your fist. Wander through its shady walkways and gawp at that iconic chandelier in the main prayer room – but remember to cover your arms, legs and head (ladies, you’ll need a headscarf). You might be expecting to wander through a traditional Middle Eastern souk – a frankincense-scented labyrinth with goatskin handbags and mountains of spices – but you won’t find any of those in glossy Abu Dhabi. The SOUK at Central Market (Hamdan Street; 10am-10pm Sun-Thurs, 10am-11pm Fri & Sat) is an upmarket nod to the city’s trading roots, though – its shops are laden with all the antique furniture, stained glass lanterns and Aladdin slippers you could wish for. Pause for mint lemonade and a puff of shisha in Shakespeare Café, then lose an hour bargaining for treasure. Outside, the sun is shining and the Corniche – with its powdery sandy beach (free), ice cream shops and glamorous crop of sunbathers – is waiting. Stroll along the wide pedestrianised walkway that hugs the beach and pick a spot to lay your beach towel: from here, you can peer up at the collar of skyscrapers that overlook the Arabian Gulf. Those shimmering glass towers are hotels, office blocks and apartment buildings – in the morning, they cast a shadow on the beach, but the sun rises over them by midday. Tonight, it’s time to scale one of those skyscrapers in search of vertiginous sunset views – and dinner. On the 31st floor of Le Royal Meridien hotel, Stratos occupies a suitably lofty spot, and thanks to its very swanky revolving restaurant you’ll get 360-degree views of the city lights. You’re among Abu Dhabi’s movers and shakers up here, so feast on wagyu tenderloin steak or lobster mac and cheese (yes, really) as you watch the world go by. This morning, it’s time to flex some serious plastic – or at least dream of doing so. Abu Dhabi Mall, in the centre of town, is a monument to the city’s favourite hobby: shopping. Even if you don’t share this passion, it’s worth a pit-stop to witness the sheer scale of Abu Dhabi’s lust for retail. All of the world’s big brands (from high street to high-end luxury) rub shoulders here, with a distinctly Middle Eastern style: note how all of the mannequins are modestly dressed – even the ones in lingerie shops are covered up. 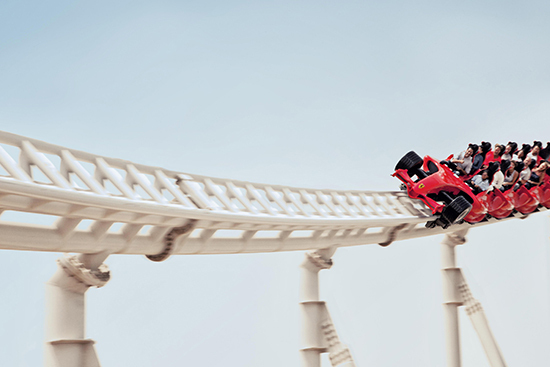 For more high-octane thrills, head to Ferrari World Abu Dhabi, home of the fastest roller coaster in the world, Formula Rossa, as well as Flying Aces, a new ride which boasts the highest roller coaster loop in the world. You’ll also learn how Ferraris are made, see some of the manufacturer’s most sought-after cars up-close, and witness the thrill of track racing in state-of-the-art simulators. Catch your breath in one of the onsite Italian restaurants. 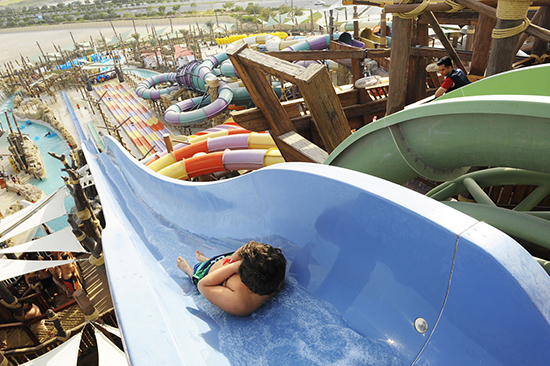 Next, take your thrill-seeking to Yas Waterworld, with its whopping 45 rides and slides – if you can squeeze them all into an afternoon, we salute you. Luckily, the park doesn’t close until 7pm (or 11pm on Thursdays for ‘Ladies Night’), so you’ve got plenty of time to tackle the dizzying Dawwama tornado ride, white-knuckle Liwa Loop and terrifying Hamlool’s Humps. For youngsters, there are three mini slides and a splash area, plus plenty of pools throughout the park. 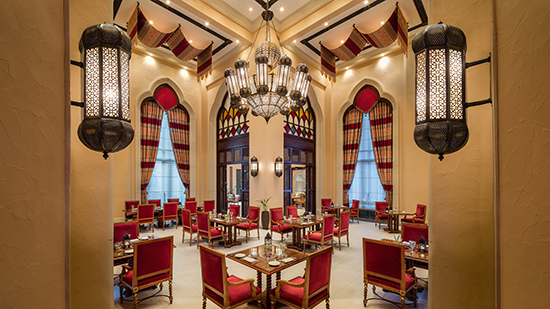 You’ve earned a hearty dinner, so treat yourself to a meal at Mezlai in Emirates Palace hotel – one of the few restaurants in Abu Dhabi where you’ll find traditional Emirati fare. You will have spotted this regal hotel on your exploration of the Corniche – it’s a gleaming 7-star, turreted palace hotel set in acres of lush landscaped gardens. Its most prestigious guests arrive via the hotel’s helipad – but you can take a taxi instead. For dinner, we’d opt for the lamb madfoun (roast lamb shoulder with tomato and chickpea sauce) or grilled hammour (local white fish), followed by a cocktail on the beach at Breeze Lounge.